Lynch’s representation of the American film industry hinges on familiar, romantic images of classic Hollywood. Diane’s alter ego, Betty, with her bright eyes, blonde locks, and bubbly charm; and Rita, a dark and sultry mystery woman, are visually contrasted constantly, underscoring the classic blonde/brunette, good girl/bad girl movie trope. Several old movies are either explicitly referenced or are obviously borrowed from. However, this old Hollywood glamour is continually linked to violence and power abuse. The Cowboy, an iconic symbol of American cinema, adopts a frighteningly omnipotent and omniscient role. We see mob members and men behind glass walls running the show, while talented directors and actors are removed from power. So when it comes to representations of Hollywood’s seedy underbelly, why does Lynch temporarily abandon cryptic symbolism? To warn the folks at home about behind-the-scenes crookedness? Perhaps, but maybe Lynch is using alienation and familiarization simultaneously to create, as the DVD cover states, not a piece about industry corruption but “the movie business itself.” This shift, though slight, introduces a new character into Mulholland Drive–us, the audience. Betty’s audition scene skillfully steers this shift, despite being the most plainly presented scene in the movie. Exactly why this scene is so intensely eerie and darkly disturbing is tricky. There is no otherworldly lighting or special effects, no symbolic objects, suggestive music, or cryptic statements; only plainly dressed, morally ambiguous onlookers. Lynch has removed anything that would distract from the art of acting. What Lynch does here is momentarily suspend fiction. This is not Betty, whose relatively feeble acting abilities were seen earlier in the movie, or Diane, who hasn’t been introduced. Instead, Lynch demands that we see Naomi Watts. Without this scene, we risk watching Mulholland Drive without acknowledging that the film is itself a product of the movie business, an industry fed by our attention. When Naomi Watts emerges from the shadows of fiction, we can no longer pretend to be passive viewers. 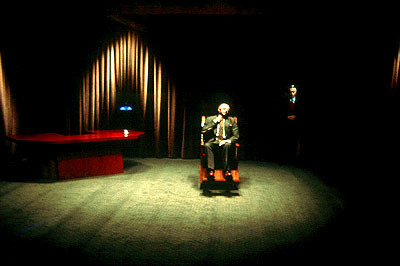 Lynch exposes us as an involved audience, fueling a corrupt industry with our primal voyeuristic desires. When Diane descends into psychosis, driven mad by her unfulfilled desire to appear before an audience, Lynch’s portrayal of the movie business haunts us. The evils of the film world are not confined to Hollywood; they lurk in our movie theaters and living rooms. For although Diane is devastatingly isolated on screen, we know she is not at all alone. It is our rapt attention that feeds her demise. We are complicit in our voyeurism. This entry was posted in Relevance of Humanities and tagged David Lynch, Maggie Patterson, Movie Night, Mulholland Drive, REL 360 by admin. Bookmark the permalink.